I picked up a used copy of Tales of the Alhambra today. I had heard the title before but didn't know it was written by Washington Irving. It has charming colored engraving illustrations. As we approached the Alhambra this morning, a young gypsy woman handed me a red carnation, grabbed my right hand and proceeded to tell my fortune. As it was in southern Spanish I couldn't understand most of it, but I did get the words 'a great love life.' I told her 'Thanks, but I have already had it' as she grabbed my left hand. Every girl should, just once in her lifetime, have her fortune told on a sunny morning in Spain at the entrance to the Alhambra, by a gypsy fortune teller. Now shouldn't she?" The book cost me $0.50 but I think the story was priceless. I have been doing a fitness challenge with friends this month. Here's how it works as my friend Afton puts it "You make your own goal. Whatever you want. Then we make you pay if you screw up." Well, My goal is to go to a yoga class everyday (except Sunday) this month. So, there has been a lot of Yoga going on around here. My 6 year old ever precocious and coordinated has been doing some yoga of her own. We got this book from the library The ABC's of Yoga for Kids by Teresa Ann Power. She has been having a great time doing yoga on her own. I will find her with my old mat spread out carefully following the instructions in the book. 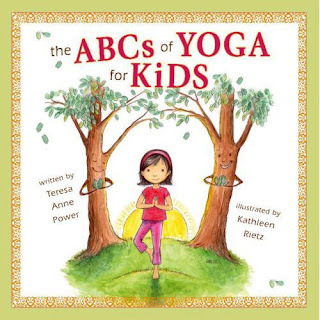 Some of the poses have been given different names to fit the ABC theme but the little verses help the kids remember how to do each pose. Yoga has been great for me physically and mentally. I feel great! I don't usually get to say that. What I love about it is that I get a good workout without the high impact. I have never been much of a MOVER, exercise and I have never been friends. I like to walk because I like the scenery, I like to bike because I like to feel the wind in my hair, I swim because I am part fish, I love to dance because it is dancing, but exercise for exercise sake? No way. I do like to be in touch with my body, I want to be healthy and I have felt the need to be stronger physically and this has been such a good fit for me. I love that my daughter wants to join me in this journey.